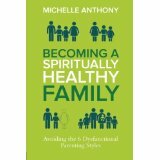 In her book “Becoming A Spiritually Healthy Family” Michelle Anthony compares our life journey to that of families working together to “live on script each day,” pressing on toward the goal. She identifies six dysfunctional parenting styles and shows how by shifting our goals we can live abundant lives resulting in spiritually healthy families. Anthony helps the reader identify their parenting style, assess family relationships, determine responses, and consider fresh perspectives. She uses personal experiences; illustrative stories, Biblical examples, and practical “Reflect and Respond” questions and exercises to form practical affirmation statements, and action plans, for formulating authentic environments for becoming a spiritually healthy family. “Becoming a Spiritually Healthy Family” is packed with workable Biblical principles and practical life changing guideline, inspiring a new generation of parents to model Christ and to train their children to know God’s Word and respond to His love through a commitment to follow Him.